Here’s a sneak peek at the first chapter of OVER MY HEAD, the sequel to my novel WHAT I MEANT… (Random House). It takes place two years later, and Sang’s got some guy issues, especially with one college-aged lifeguard at Fanny Chapman Pool! *Update: Available for sale NOW! Click here. THIS IS IT. Gary Westbrock is going to confess his undying passion for me, Sang Jumnal. Finally. See? Good things do happen—even to me. It’s like all that positive karma I’ve been putting into the universe for years is finally flowing straight back to right here, right now. We’re sitting side by side at a picnic table outside Planet Smoothie. I gaze at his blond eyelashes glittering in the noon sun. At the spray of freckles that stretch like a comet across his left cheek. At the long strawberry bangs dangling over his forehead. “What is it, Gary?” I smile deeply so the dimple on my right cheek shows. You are the woman of my dreams. Could you possibly ever care for me in the same way, Sang? “Sang!” This interruption is from Megan, who’s by the parking lot waving her cell. My fantasy evaporates as I blink at Gary, who hasn’t really told me anything yet. I find Megan leaning against the side wall of Planet Smoothie with her boyfriend David Jovanovich. I can tell they’ve been making out because David’s lips are swollen. He suffers from sensitive skin, among other things. “Sorry,” I say, taking Megan’s cell. My parents believe cell phones are a waste of money (in other words, my parents are cheap). I did have my own cell a few months ago, which I paid for, until I lost it. “Hey Mom,” I say into the phone. “Right now?” School just let out for summer only a half hour ago. The sidewalks of good old Doylestown, Pennsylvania are swarming with girls in shorts and camis, and guys in baggy shorts and T-shirts. On the streets, upperclassmen zoom by in cars, with windows down and music throbbing. Nobody has to rush home. “But—” The line goes dead. I close the phone and bite my lip. Something’s up at home. Something has been for some time. There have been lots of phone calls from relatives in India. A number of times I’ve seen the light under my parents’ bedroom door late at night, and heard them talking in worried tones. Last week when I asked my parents if anything was wrong, Dad said, “Nothing, why?” Then he gave me this horrible fake smile, showing more teeth than necessary. Part of me wants to race back to see what’s going on. Most of me wants to stay put. But, as usual, Dad didn’t exactly give me a choice. “And I gotta work.” Megan pulls a Planet Smoothie cap from her bag. “Leaving me. Again,” David says dramatically. “Forever departing.” He spreads his arms like a Shakespearean actor. Despite the 85-degree weather, brainiac David is wearing his usual long corduroy pants and T-shirt. Today the shirt, which is sweat-stained, says “Happy Days” in script. Still, Megan looks at him adoringly. “It’s just a few hours, my little David Duckie,” she says. She ties her shiny shoulder-length black hair into a bun and puts on her cap. “Hours and hours, my dearest Mrs. Tiggy-winkle,” he says. I try not to gag. This sounds paranoid but he’s actually right. Megan’s parents—Drs. Chung and Chung, licensed psychologists—are brilliant masters of manipulation. First they present their daughter with a ticket to a two-week teen group trip to Europe in August. Then they ask her to pay for a portion of it by working, to which she eagerly agrees. So now, instead of being with David all the time, she’s going to be spending every waking hour crushing ice and fruit in a blender to make money. Clever. Clever indeed. “Adieu,” David says. He kisses Megan on the cheek. “Megan Chung in love,” I say and sigh. “Bite your tongue.” Anna Kaprowski’s seventeenth birthday party is in a few weeks, it’s going to be elegant, and practically everyone is going with a date. Including me. Right after Gary asks me out. And if he does it fast, I’ll have time to run home before my dad gets too annoyed. Then everyone will be happy. Especially me. Megan’s idea of asking David out was to say, ‘Would you kiss a girl who just ate cheese?’ Still, the answer was yes. “No, I couldn’t,” I say and sneak a peek at Gary, who is now leaning back with his elbows on the table. “I’m not passive.” I cross my arms. “I’m not lost,” I say a bit too defensively. “Oh, Sang. I just want you to be happy like David and me. It seems all wrong me feeling so wonderful when I sense you’re so…” Megan gives me this worried look and tucks a lock of hair into her cap. “No!” I grab at her but she wriggles away, dashes over to Gary and immediately starts talking. I cringe. Megan’s definitely not what you’d call smooth when it comes to dealing with guys. She blurts out the craziest things. Like asking them if their socks smell. Or if they shave under their arms. She’s a mess, which is partly why she and David are so perfect together. He’s too bizarre to care. I close my eyes, pretending I’m somewhere else. Anywhere else. “See? No problem,” Megan says. She winks at me as Gary and I head off into the sunset. Or rather, into the noontime glare of State Street. We walk by places that over the past week I’d tried without success to get a job at: Nat’s Pizza, the Bagel Barrel, and a bunch of pricey restaurants. So far, the only job I’ve been able to line up this summer is dog sitting for my neighbor’s poodle. Not exactly the big bucks. God. I’m still babbling. What am I saying? Something about us spending tons of time together? How is he ever going to ask me out if I never shut up? Then I see THE dress in the window of the This Is It! boutique. I can’t believe it’s still there. It’s 1950s retro and strapless, with red fabric and a wide black sash. As soon as Gary asks me out, I’ll get my mom to buy it for me as an advance birthday present. I will wear it to Anna’s birthday, where everything will be perfect. I imagine myself on the dance floor with Gary. I can practically feel his arm around my waist and sense the warm passion as the two of us stare deeply into each other’s eyes. “Nice,” Gary says with feeling. I turn to him but his eyes aren’t on me. They’re not even on the dress. He’s looking at Trish Crowdly. She’s walking with her clones Meredith and Liselle. Trish. Sort of rhymes with a choice B word. She’s spoiled. Going into twelfth grade too. But while I just got my permit in April (okay, so I applied for it really late), Trish already has had her driver’s license and her own car for forever. She has one of those early birthdays. She does everything early. Like guys. She has tanning salon-darkened skin, bleached teeth, and the rose tattoo on her hip is always exposed above her low-slung jeans. From elementary school through middle school, Trish thoroughly enjoyed making my life miserable. Fortunately she’s not in any of my honors classes, so I rarely see her these days. Unfortunately, Gary seems to be getting a real good look at her right now. His eyes follow Trish as she continues strutting along the sidewalk. I spot a rare “Help Wanted” sign in the window of Coffee & Cream and immediately pull Gary toward it. “Need to grab a job application,” I explain. We climb the steps and I open the door to the tiny coffee shop. Inside is refreshing air conditioner cool and there’s the delicious scent of fresh coffee beans. “Isn’t that Gina Baldarasi’s older sister behind the counter?” Gary asks. I nod. Even after all this time, I still feel a pang of sadness hearing Gina’s name. I guess that’s just how it is with an ex-best friend. “Oh, hey kid,” Michelle Baldarasi says as we approach her. She’s sporting a nose ring and wearing a blue apron over her camouflage pants and khaki T-shirt. She always looks like she’s ready for war. “How’s your brother? He around?” She waggles her eyebrows. Michelle grins. “True. Hey, power to the people.” She raises her fist like she’s just liberated the world. “Power,” I say and partly raise my fist, but I feel more like a cheerleader than a conqueror. Quick as a flash, Gary and I are back on the sidewalk in front of the store, and to my relief, Trish is nowhere in sight. I wish more guys were. Time ticks on. I imagine my dad waiting for me, tapping his toe, frowning. “Uh, Gary, didn’t you want to say something to me before? To ask me something?” I hate how pushy I sound. “Um, well yeah, actually.” He runs his hands through his hair. This, really, is it. I hold my breath. 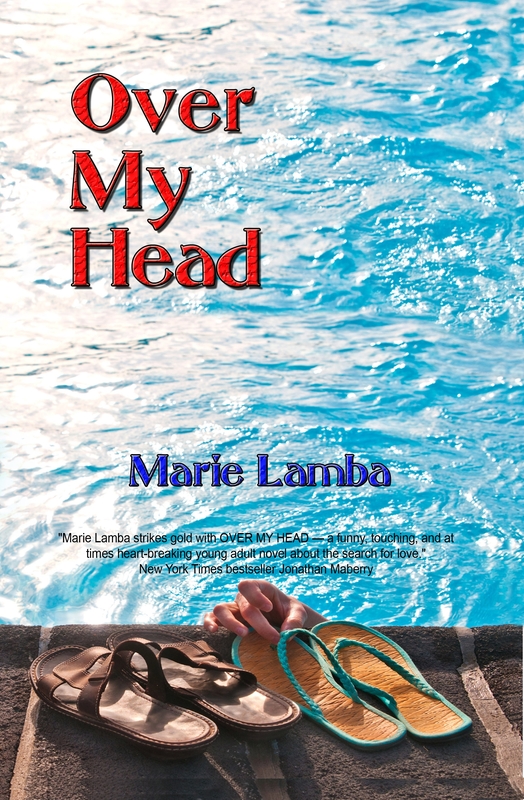 To read another excerpt of OVER MY HEAD, you can click here. To find out more about this and my other books, click here. I love this Marie! I also love that its set in our town, and can see it all happening before my eyes! I like Sang immediately and cant wait to read the rest of her adventure. Congratulations! Thanks, Donna! It’s so great writing about Doylestown. It’s a cool setting for a novel. Great opening! Poor Sang! I hope she finds her true love. I guess I will have to read it and find out! Nice to see you here 🙂 And thanks. You won’t have to wait too long… Excited! Great beginning. So excited to read the rest. Read the other excerpt, too. Sounds like Sang is in for some summer adventures and romance. I am hoping for a happy ending for Sang. Can we download to the Kindle yet? So painful, so joyful, so true to life! This looks like a great followup to What I Meant! Everyone in Dtown should snap up a copy before they sell out! Looks good. Can’t wait to read it! Thanks, Kayla! You won’t have to wait too long…should be out next week or so! Just read the first chapter. I sincerely believe you have a winner. You are weaving in the local hotspots of into the story line expertly. Wish you all the luck. When would this be published? Can’t wait to read the whole book. It’s just gone live as an ebook at Smashwords, and over the next few days, it’ll be up at other sites and the paperback version will be available. Yeehah!